Extensive product and disease profile training ensures that our employees are equipped to promote product portfolios confidently among HCPs while also having a thorough understanding of patient needs. Access to affordable healthcare is a global priority. The medicines we manufacture and distribute positively enhances the quality of life of patients globally. We continue to focus on developing a product portfolio that leverages our intellectual and manufacturing advantage, including investment in effective older specialty medicines that provide viable treatment options to expensive new innovative drugs. Through our extensive global presence, we extend the availability of our medicines and products to new patient populations. Our diverse regional portfolios provide patients and consumers with a broad range of treatments across a number of therapeutic categories in both branded and generic medicines, and in the prescription and OTC segments. This portfolio includes some of Aspen's most well-known brands, with strong presence in Australasia and Sub-Saharan Africa. Across the globe, patients require anaesthetics during major surgery, local surgical procedures, and for more minor pain control situations. Our portfolio includes products that are indicated for the induction and maintenance of general anaesthesia, opioids used during induction, maintenance and recovery and neuro-muscular blocking agents used to facilitate intubation and to relax the muscles for surgical procedures. Our regional and local anaesthetic products, include injectables and topical agents such as ointments, gels, sprays, creams and patches. Thrombosis occurs as a result of the body's hemostatic pathway being activated inappropriately, leading to the formation of blood clots. This condition is considered as life threatening as it may lead to a stroke, myocardial infarction, ischemia and others if not appropriately treated. Our basket of thrombosis products fits into the anticoagulant category, aimed at the prevention and treatment of thrombotic diseases, including deep vein thrombosis, pulmonary embolism and acute coronary syndrome. Our focus in this portfolio is the low molecular weight heparins, Xa inhibitors and heparin derivatives. Our products in this therapeutic category are characterised by medicines that generally contain APIs which evoke the indicated response when administered at a low concentration. Most of these molecules have a narrow therapeutic index allowing for a small window between the effective and toxic doses. These medicines are often used in life-saving medical conditions and due to their potency and toxicity are manufactured under specialist conditions. Included in this portfolio are our products that are designed to treat underactive thyroid conditions, immunosuppressants, oncological products, female hormonal replacement therapies, anabolic steroids and glucocorticoids and estrogens. While breastfeeding is best for infants, in circumstances where breastfeeding is not possible, our infant nutritional products provide mothers and caregivers with a science-based alternative. Our growing up milks are designed to supplement the diet of children older than 12 months, providing them with nutrients that may otherwise not be consumed in sufficient quantities. In early 2000, South Africa was coming to terms with the significant social, public health and economic impact that the catastrophic HIV pandemic was presenting. At the time up to 350 000 South Africans, mainly young adults, who would be the future backbone of our economy, were perishing each year from this unchecked pandemic. Most, if not all, ARVs, were inaccessible, due to dollar denominated prices and patent protected products. Inspired by a collaborative effort with former President Nelson Mandela through the Engcobo Clinic, Aspen was able to negotiate licences for these ARVs, eventually together with multinational partners introducing generic ARVs to the South African public ARV programme at a fraction of the original cost. Subsequently we pioneered the first African produced generic ARV. We were an African company finding an African solution for a largely African problem. The South African public ARV programme was accelerated and millions of lives were saved. We continue our pioneering leadership in the HIV market, most recently being the first company to introduce Dolutegravir and other Dolutegravir-based combinations (TrivicayⓇ and TrelavueⓇ). Given the prospective future importance of Dolutegravir-based ARV formulations, we will continue to introduce additional Dolutegravir combinations in order to widen treatment options for both HCPs and patients. Intellectual property, in the form of developed, licensed and acquired product molecule dossiers, is the key driver for organic growth in the pharmaceutical industry. Our product pipeline largely represents opportunities related to acquired product dossiers, planned product line extensions to leverage existing brands within and across territories and targeted branded product acquisitions. Also included are selected products that are developed under the direction of highly skilled scientists employed by Aspen at our internal facilities as well as in collaboration with other global pharmaceutical companies and research facilities. Products in the pipeline are aimed at therapeutic categories relevant to emerging disease profiles in each territory. The pipeline is continually monitored for technical feasibility and alignment with the Group's commercial objectives in key territories. Acquisitive growth, in the form of corporate acquisitions and product distribution arrangements, largely entered into with leading multinational pharmaceutical companies, supplements our organic growth strategy and strengthens our ability to respond to identified healthcare needs. During the year, we launched 45 products in 20 countries. This has included the significant launch contribution from two relatively new Aspen territories being the United States (Busulfan IV) and Japan (nine products launched across different therapeutic categories). The robust South African pipeline continues to deliver important launches, one of which was Relvar (Vilanterol/Fluticacasone), a new product included in the asthma portfolio. 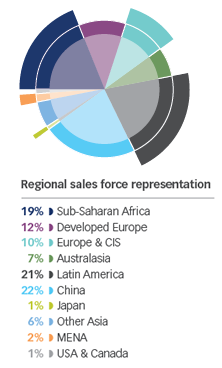 The Latin American region and Australia have also leveraged brand equity with new product entries during 2018. The total in-market sales value of the molecules that are included in the Group's product pipeline as at 30 June 2018 and that are expected to be launched in the next five years, amounted to USD3,4 billion. This value is determined using the published IMS value as at 31 December 2017 for the molecule in the country concerned and where no IMS data is available, no value is included. The value realised through the pipeline is influenced by many variables, including market competition, prevailing pricing regulations, technical validations, product registration timelines and in the case of generic products, the level of discount compared to that of the originator molecule presently sold in the market. The launch of estrogens in the United States is a significant component of our pipeline. Esterified estrogens were successfully launched in the first quarter of the 2019 financial year. In respect of the synthetic conjugated estrogens, trial batches are underway with planned stability submission batch manufacture thereafter and an anticipated launch in 2020 financial year. The reactivation date of the New Drug Application ("NDA") for Orgaran in the United States is effective in the final quarter of the 2018 calendar year. The protocol for the heparin-induced thrombocytopenia ("HIT") studies have been submitted and the trials will start shortly with the objective of adding HIT as an indicator to Orgaran in the United States. The extension of the Orgaran brand into new European markets is expected in the near future. With certain regulatory issues having been resolved, opportunities to relaunch Nimbex with an extended shelf life and to launch EMLA in China continue to be pursued. While the addition of an indication to the existing dossier for HPC in the United States was denied by the US FDA, an abbreviated new drug application ("ANDA") on the preservative free has progressed to a priority review, with an estimated launch date in the first quarter of calendar year 2019. We are committed to ensuring that we promote our products responsibly across all our commercial operations. During the year, we introduced our Group Code of Marketing Practice. This Code is aimed at ensuring that any promotional activities and interactions with HCPs, other healthcare staff, government officials, regulatory officials, patient groups, media and the general public are carried out in a responsible, ethical, professional and legal manner. Specific training on the implementation of this code has been undertaken across our operations and will form part of ongoing training programmes. We are also committed to complying with other relevant regulations and legislation in respect of matters relating to consumer relationships, including advertising standards and consumer engagement protection laws. Aspen Nutritionals fully subscribes to the WHO International Code of Marketing of Breast-Milk Substitutes and adheres to all national government legislation pertaining to the implementation of this code. The Aspen Learning Academy was established in 2013 to support and provide world class training to our commercial teams. 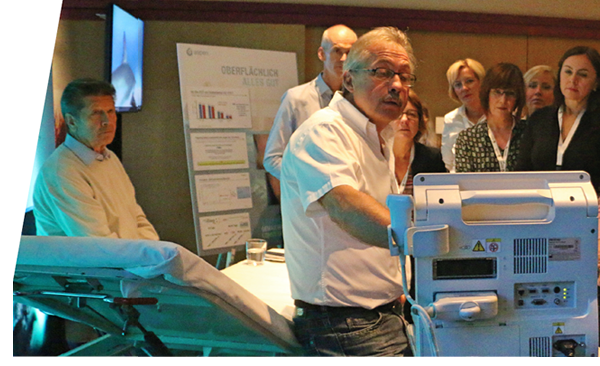 The training provided to our qualified medical representatives is aimed at ensuring that they have specialist product knowledge to support and guide those HCPs they interact with. We conduct product awareness training for employees and for customers, as appropriate. Since we do not deliver products directly to the end customer or consumer, we take care to ensure that only accredited third-party distributors are used to provide logistics services and in certain markets, wholesaling services. All our suppliers and service providers are bound by the Aspen Supplier and Service Provider Code of Conduct and are required to uphold prescribed ethical and human rights standards across the supply chain. The Aspen Group Pharmacovigilance team, headquartered in Ireland and supported by the local business units globally, is responsible for monitoring and managing the safety of all Aspen products. Pharmacovigilance covers the activities relating to the detection, assessment, understanding and prevention of adverse effects or any other drug-related problems, and is core to our patient responsibility. As part of our product life-cycle management process, we continuously assess the risk/benefit relationship of our products. In collaboration with health regulatory authorities, we endeavour to provide all HCPs and patients with comprehensive up-to-date safety information, which allows for the safe use of our products. In line with best practice, we source product safety information from multiple global sources and ensure the consolidation and review of this data. We use this information to enhance our product safety information, which is made available through the required channels. 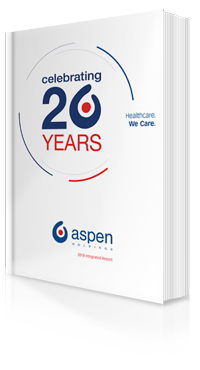 All clinical trials conducted and/or supported by Aspen are conducted in full compliance with relevant legislation and are subject to close monitoring for compliance. The S&E Co provides oversight on consumer relationships as it relates to pharmaceutical and nutritional product quality and adverse drug reaction incidents reported globally. Since patient safety is of primary importance, we have a zero-defect approach to managing product quality. We recognise that we are accountable for the responsible manufacture and supply of products in accordance with applicable pharmaceutical regulations, legislation and guidelines. This underpins the trust in the Aspen brand. Stringent compliance procedures are in place across the supply chain to maintain and grow customer confidence. Regulated in-process and supply chain quality management controls are in place and strictly applied. Raw materials and packaging materials are purchased from accredited and authorised suppliers who meet the necessary quality, regulatory and Aspen-specified requirements. Products are manufactured at our own manufacturing sites or sourced from reputable third-party suppliers. Manufacturing sites are required to comply with good manufacturing practice ("GMP"), which governs the manufacture of products in the pharmaceutical industry, and to uphold the status of pharmaceutical regulatory approvals that are relevant to the supplied territories. The Aspen Quality Assurance Department as well as various regulatory agencies conduct audits of potential and existing suppliers to support the high quality objectives and compliance to GMP across the supply chain. All inspection findings are closely managed through to close out, with critical findings receiving executive management oversight. Only products that meet the prescribed quality and regulatory standards are released for sale into the market and regulated quality compliance controls are in place. The quality and efficacy of supplied products are monitored throughout the product lifecycle using systems approved and monitored by regulatory authorities. As the holder of the marketing authorisation, we are responsible for the quality of our own products across all territories. In line with global trends to combat counterfeit medicinal products, we are committed to compliance with all medicine serialisation requirements implemented globally. These measures require a comprehensive system to track and trace medicines through the entire supply chain to the end user, the patient. We have ensured that serialisation capability is being implemented in all internal and external sites and we are on schedule to meet the EU serialisation regulations which come into effect in February 2019. Aspen undertakes a comprehensive product life-cycle management programme. This programme ensures that products are updated to meet latest requirements and ensures that they are stable throughout their shelf-life. There were 17 product recalls initiated during the year. Of these, 10 related to the Anaesthetics portfolio which is in line with the increase in anaesthetic products sold during the year. There is, however, an increased focus and oversight in respect of incidences related to the acquired Anaesthetics portfolio. None of the product recalls represented a high patient risk requiring the implementation of a full market recall procedure.